Could Jessica and Grandma Huang's relationship be fixed? Here's a recap! When Elaine sees that Jessica and Grandma Huang aren't in a good relationship, she tries to help her build upon it. After learning the fundamentals, she uses it when playing a game with Grandma Huang; at first, it seemed that Jessica was going to lose it but regains and acts nice and shows her care. Even though Grandma Huang could see what was going on, she uses it to her advantage, but Jessica could play it her game too, and soon the two have a good understanding relationship. Meanwhile, after making fun of Emery's weakness; Louis tries to fixes his relationship with him by using his neighbor's "good luck" wrestling technique. At that point, it became known that Emery finally could take down someone like his old man as he won the wrestling match by accidentally punching him in the face. Call it the Ali moment. Even though it was a shocker, they were soon on good speaking terms. 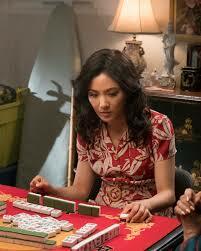 "Grand-Mahjong" was an excellent episode. It was very much one of the best episodes; with not only the ensemble cast but also the guest stars too with Ming-Na Wen and Reggie Lee. Strong character development and writing that I give this episode a 9/10. What did you think of the episode? Leave a comment and tell us what you thought.